These three black and white photographs show the construction and moving into the Sharp Halfway House. The Menninger Clinic philosophy of treatment was the bio-psycho-social approach. This philosophy of treatment integrated medical, psychodynamic, developmental, and family systems to treat the total health of patients. Some people needed supervised living during part of their treatment and the halfway houses filled this need with a trained staff. 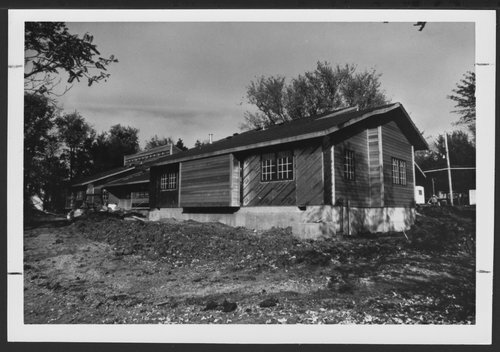 Construction of new half-way house for the Menninger Clinic, Topeka, Kansas - Construction of the halfway house on Frazier Street, south east of the Calder building.